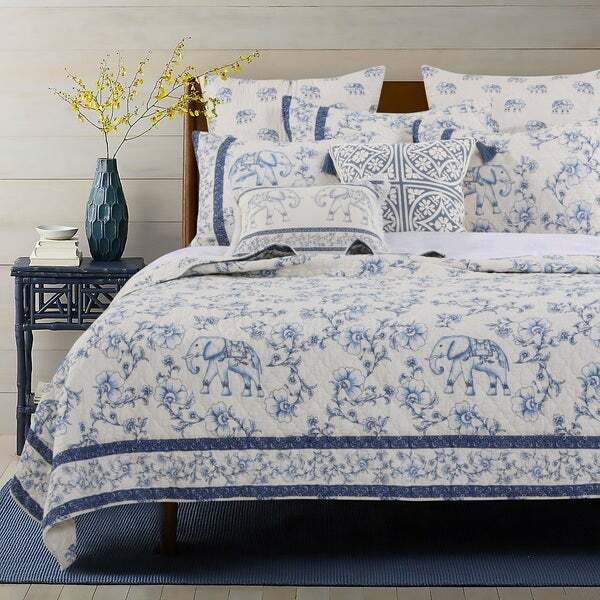 Symbols of stength, power and loyalty, stately dressed elephants parade among porcelain botanical flourishes in this fashionably global quilt set. Block print border embellishments complete the look of this timeless classic. Oversized for better coverage on today's deeper mattresses. Machine wash. 100% microfiber polyester face. 100% Cotton back. 60% Cotton, 40% polyester fill. Dimensions: Twin 68x88" + 20x26", Full/Queen 90x90" + 20x26" (x2), King 105x95" + 20x36" (x2), all dimensions +/-2". Each set comes with quilt plus two pillow shams (one sham per Twin set). I looked at a lot of elephant type bedding sets and committed to this one. this is a beautiful set, I purchased with the matching curtains to place over a dark wood bed set and it compliments nicely. The elephants are cute and subtle, making the room elegant. I really like the color of blue. Elephants are my favorite. The quilt is so soft and warm. The pillow shams fit perfectly on my overfilled pillows. I highly recommend this product. It fits my queen bed perfectly. I just love my quilt. It is classic and fun at the same time. It is well oversized for my queen bed to cover well. The back side is also printed with a parade of little elephants which i did not expect. This is not a poly filled quilt. Beautiful spread. Cream and blue, not white and blue. Blue like a traditional French like print but the elephants are subtly whimsical and different. Very soft. Not too heavy, lays well. I got a king for my queen size bed because it’s a high bed. Covered box springs and frame, no need for dust ruffle now. I would buy it again. Looks just like the picture. The fabric is soft and quilted. The pattern and the blues are very pretty. There are a few thread snags, but nothing major. So far, I am very pleased with this purchase and would recommend. *** I have not washed this item yet, so I may emend this review at some future point. It is so comfortable and beautiful! I was a little worried about ordering it due to the negative reviews stating it came discolored or became discolored after washing, but I have to disagree with those comments when it comes to my order! Besides it being more of a creamy color rather than white, it is just as I expected it! Came on time, feels comfy, looks gorgeous! This quilt is really cute and I love that it's reversible. The only downside is that it doesn't wash well. While the material holds up when laundered stains don't come out easily. Muddy pawprints are a problem at my house and they left yellow discoloration on the quilt even after treating and washing. The quilt is a little on the thin side, but it is of high quality and beautiful. I bought this for my daughter’s elephant-themed room, and we both are crazy over it. Beautiful quilt and pillow cases. Exactly as it appears on website. 😍 Love it!! Sooo soft and washed well! "Is the set more blue or lavender? One of the reviews said the color was more purple"
I use a lot of blue and white - chinese accents, etc. and I like the simplicity of this design and reasonable price. "The picture contains a few more pillow and pillow cases than what are offered with the 3 piece price. Can these extra items be ordered separately?" Unfortunately there are no extra items available at this time.